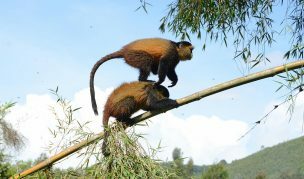 This wonderful safari will take you to Nyungwe, a vast montane forest found in the South West of Rwanda. This is a recognised huge forest in central Africa with over 10000sq.km. This natural forest is famous for its large groups of colobus monkeys, chimpanzees, butterflies and a rich variety of orchids. This forest is found at a relatively high attitude with a rugged steep slope. Then it continues Lake Kivu a beautiful lake with so much to offer before en-routing to Parc National des Volcans, haven for the tender mountain gorillas. Appreciate the beauty of this gigantic tropical rain forest of Virunga. End with a tour around Kigali; visit the Genocide memorial at Gisozi and the Rwanda National Museum. Arrival in Kanombe at Kigali International airport. Meet and greet the guide before transferring to Kigali. Optional: depending on your arrival time, enjoy a City tour; visit the genocide memorial site and art and craft centres. Or straight from the Airport check into the Hotel. 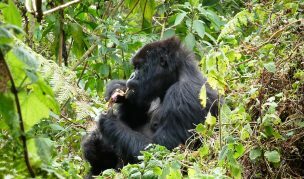 After an early breakfast transfer to Nyungwe Forest National Park. This drive takes about 5 hours. Make stops at local markets, the traditional palace in Nyanza. Continue to Butare, visit the Botanical Gardens and the cultural museum. Pass through green fields of tea scattered across the hillsides and the small unique wooden houses surrounding Nyungwe Forest, on arrival check into the lodge for an overnight. Have an early breakfast, transfer to the park headquarters for a briefing. 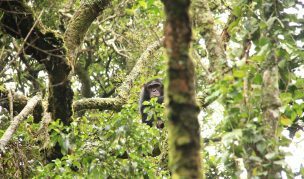 With a park ranger enter the forest for Chimpanzee trekking. 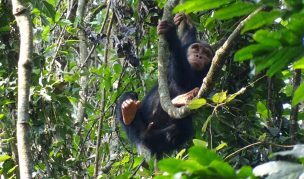 Enjoy chimps viewing; as they swing from tree to tree, branch to branch and the little ones feeding on fruits or hiding behind their mothers. Follow them from nest to nest till you have had your full. Then either enjoy the Canopy walk or the waterfall trail walk in the forest before exiting it. A combination of all these activities or any one of these activities is a reward and a wonderful experience. Later return to the lodge for an overnight. With an early breakfast, enjoy nature walk. This will be conducted in the company of a park ranger. 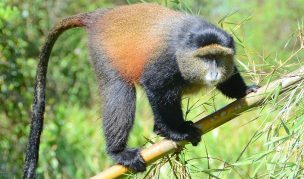 On this nature walk search for the largest groups of colobus – enjoy viewing many monkeys in large groups and different bird species including; the Rwenzori Turaco. After the walk take a break and relax with a picnic lunch in the middle of the forest. After lunch make your way back to the lodge. Relax at the lodge and later retire for an overnight. With a morning breakfast proceeds via Kibuye. Enjoy the stunningly beautiful views from Lake Kivu up to Gisenyi; beautiful countryside with valleys full of agricultural farms. Kibuye is the most beautiful of all the three resort town on Lake Kivu. After relax at the shores of Lake Kivu. Take a boat out on the lake to see the various islands. Swim in the refreshing waters or stroll to the nearby villages rambling across a number of hills. After breakfast, either drive to, or you will have an enjoyable speed-boat trip to Gisenyi. You will encounter local fishermen, fishing villages and also the residents of Idjwi Island (Congo) who are rowing long distances in their dugout canoes to visit the Rwanda markets. You will be picked up in Gisenyi for lunch before retiring to the lodge. Or if time allows you will make arrangements to cross the border to Goma (Optional). Goma was devastated by the eruption of the Nyiragongo volcano. The visit shows the fantastic capabilities of the local population to overcome this natural catastrophe! The Nyiragongo volcano (3470 m) recently erupted after 2002 eruption and destroyed part of Goma town. Most of Goma’s inhabitants escaped the advancing lava flows crossing the border into neighbouring Rwanda. Later retire to the lodge for an over night. After breakfast visit the Ross Carr’sImbabazi Orphanage. Imbabazi Orphanage was founded by Mrs Rosamond Halsey Carr in late 1994 at Mugongo to care for the genocide orphans. She witnessed all Rwanda’s historical events, including the gluesome genocide of 1994. She is the author of “Land of a Thousand Hills: my life in Rwanda.” Later take a stroll on the lake and also visit other local villages. After lunch drive to Ruhengeri continuing Kinigi for an overnight. With an early breakfast, drive to the park headquarters for gorilla briefing. 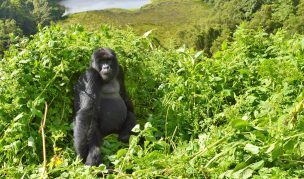 When venturing into this gigantic forest, a packed lunch, comfortable clothes, shoes and a walking stick is a must before gorilla tracking. 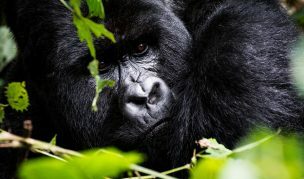 The time spent gorilla tracking is unpredictable, It varies from 2-8 hours before an encounter with the family of these gentle creatures. 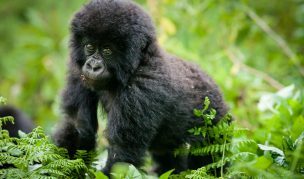 The location of each gorilla family depends on temperature, their feeding range and movement of the previous day. 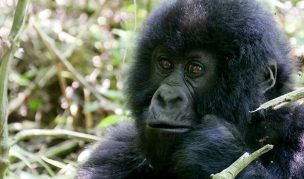 Enjoy this1 hour (only time allowed in the company of each gorilla family a day) watch and capture this memorable experience as they go about their day to day activities; the young ones playing around the old ones, feeding each other and eating foliage. The sight of these outstanding creatures is the climax of this entire safari. Later retire for an overnight at the lodge. 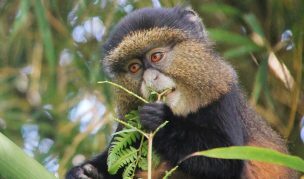 After an early breakfast, you get to choose which activity you want for this day; Either track the golden monkeys or climb the breath-taking Visoke volcano, or trek to Karisoke Research Centre; a place which was set up by the famous primatologist Dian Fossey, a brave lady who protected and saved a lot of these gentle creatures from inhuman savages. Or visit the local communities around the park. After the activity of your choice, check out of the lodge, have lunch in Ruhengeri and the drive back to Kigali. On your way to Kigali make some stops for scenic viewing, the drive to Kigali takes about 3 hours as Rwanda is a small country. Overnight Mille Collines Hotel (B-L). Depending on the time for your departure flight, enjoy city tour. Visit the Kigali genocide memorial and later transfer to the Kigali International Airport for your departure flight. This drive is about 30 minutes. Interested? Ready to go or want to know more? Let us know, below. 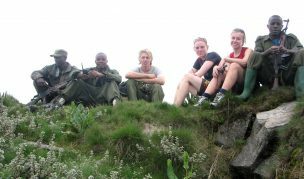 Or email info@nkuringowalkingsafaris.com.